Accomodation will be basic in a tipi. Host provides organic meals, fresh out of our ecological garden with breakfast, lunch, and dinner . We ask for a minimum stay of 30 days. In our experience it often takes volunteers a more then two weeks to feel fully connected to the vision of the project as well as the vibe of the finca and surrounding community, so volunteers interested in staying longer than 30 days are very happily welcome. Garrofera is a VERY ISOLATED land 10 km away from Sella . You can feel the philosophy for the following text: " We understand that we are part of a larger ecosystem, of which all the species of planet Earth are part (which belongs to an even greater system) including the species of the "Garrofera. The place where our project begins, it is a place that was and abandon cultivated land where Carob Tree was able to surviveand turned the place into a carob tree area (Garrofera) And that's why we want to be a being, to be beautiful and to be connected with oneself and with other major and minor systems, so that we enjoy life, while living the experiences that life brings to you in the day to day." Apart from taking part in the Workshps organised by the association you can practise climbing and there are plenty of trails to enjoy trecking as well and a natural pond to swimm. Close to the place you can find the opposite type of spots such as Benidorm or Altea, as touristic developed towns which you may visit in your spare time, if you need so. Garrofera project is MAINLY a CULTURAL and PERSONAL EXPERIENCE for volunteers, to be able to live under hard, integrist, ecological, spiritual conditions. Dont try to change the place but integrate: just experience the brights and shades. This community offers as a radical alternative to conventional life and try to learn as much as you can from it. Work has an environmental character. In Altea, there is a river Algar, which is natural habitat and where protected plants inhabit. At the same time, there are some invasive plants. The task of volunteers will be to differentiate those plants, control of the plant in biotope and clean the river from the invasive plants. The municipality will ask volunteers to do other types of manual work for the environment, depending on the necessities of the municipality in a certain moment. Tools and working boots will be available. One of the tasks could be to help on archaeological excavation site, depending on working permissions and how clean is river Algar at the moment when project is taking place. Accommodation will be in a country house 1 km away from Altea La Vella, which is a small town 4 km away from Altea provided with matresses and pillows. Volunteers will cook for themselves. The accommodation is basic. This project will include a one day only vegan food day agreed by volunteers for the promotion of environmental sustainable lifestyle. Altea is a charming touristic town, located in the seaside. It offers possibilities of swim in the sea, take a sun bath on the beach, play beach volleyball and other activities in your free time. It is also possible to see another nearby towns on the weekend. Town hall of Altea. Since the last year this town hall is developing a policy of sustainable tourism which includes the recuperation of deprived environmental areas and cultural heritage. Demanding physical work. Volunteers have to be fit for such workcamp. Camping Monte Holiday who is responsible to lodge the volunteers and has donated the land where the project takes place, De Amicitia who is the NGO responsible of developing international volunteer workcamps. De Amicitia organises 8 projects in the Camping Monte Holiday every year. The camp takes place is an empty land with some tents. The task of the volunteers will be creating and constructing a nice place for the teenagers that will be camp in the same place during the summer with some tools and materials using their creativity. The tasks will be: -Setting the kitchen facilities in the geodesic dome that is built by the previous volunteers -Building some basic furnitures from the pallets -Cleaning the area -Setting the big meeting tent (haima) and others Gargantilla del Lozoya is a natural town in the mountains of Madrid. The volunteers will have chance to connect with the nature . Accommodation is provided in 1 or 2 person tents in the Camping Monte Holiday (http://www.monteholiday.com/en/home) that offers hot showers, toilet areas, washing machines and recreation areas, swimming pool and free Wi-Fi (not available all the time and not in the sleeping area). Boys and girls will sleep separately. You need to bring a sleeping bag and a sheet. Food will be prepared by volunteers. Volunteers are asked to help with preparation of their own breakfasts and they will be provided with fresh drinks. Lunch and dinner will be prepared by the volunteers. Campsite accommodation itself provides basic conditions and the quality of those depend also on cleanliness and contribution of all participants. The workcamp takes place in Gargantilla del Lozoya, small village of Sierra Norte about 80km away from Madrid. Gargantilla is part of several municipalities of the Valley of Lozoya, most of these are little villages but you can find all you need to live. It’s near Buitrago del Lozoya or Rascafría, these are larger villages, and there you can find banks and bigger shops as well. There are nice paths in the mountains and two lakes for the leisure time volunteers will have chance to make some excursions. De Amicitia is an Environmental non-profit, non-governmental organization that is located in a rural mountainous area, Sierra Norte, 80 km away from Madrid. De Amicitia is a member of The Alliance of European Voluntary Service Organisations is an International Non-Governmental Youth Organisation that represents national organisations which promote intercultural education, understanding and peace through voluntary service. The Alliance, founded in 1982, is presently made up of full, associate and candidate members in 29 countries worldwide. De Amicitia provides an opportunity for volunteers, both youngsters and adults, to take part in local and international volunteering activities, especially towards environmental protection and sustainable development. These mainly include international workcamps, but also activities in the local areas such as reforestations. In addition, De Amicitia takes part in International youth exchanges and seminars, both as a host and sending organizations. These are focused primarily on social activities and promoting development, peace and human rights. Due to our location in a rural area, one of De Amicitia priorities is to help improve local development. Sleeping bag required. Capacity to live in tents and in the countryside and manual work. The technical work consists in the improvement and maintenance of a part of the walls of the Prat House and its surroundings. With the help of an archaeologist, all the materials will be cataloged, appropriately measured and photographed, in order to make the ancient tower a tourist attraction. This activity involves related tasks such as: removing herbs and plants, stacking them, taking them to the storage trough, learning the use of certain tools, chopping, loading stones, cleaning them, cataloging, photography , etc. These technical activities also involve related learning such as: teamwork, companionship, patience and problem- solving. Free afternoons with games, dance workshops organized by the Campredó Ball Association, cultural activities and soccer tournament. Workshops related to the Mestràlia fair: during the first weekend, the workcamp will coincide with the celebration of la “Feria Mestrana”.Two workshops will be held in the framework of the fair: a body pre-training workshop and a workshop on how to make a guitar. Free time and access to the municipal swimming pool: there will be a free municipal swimming pool service, with swimming or aquagym courses. The school of Port- Rodó, mattresses will be disposed on the floor. Sleeping bag needed. Access to the municipal swimming pool. Excavation and extraction of land in order to expose various sectors of the fortress; draw different stratigraphic sections and preparing files of the retrieved items; cleaning, sifting and classifying the items found; maintenance tasks on the forest surrounding the archeological site. In “La Morera”, a rural tourism house. There are 8 double rooms, each one with its own bathroom. There are also two common rooms with TV area, library, dining room, fully equipped kitchen, washing machine and free Wi-Fi. Volunteers will have a wide range of afternoon activities, evening and night games, which aim to improve group relationships and venture into the area of human values. Opportunity to visit the region and appreciate the most of its rich nature, visit the Montseny Natural Park and also produce articles and files about the visits. Volunteers will help to co-create the workshops in English for local children and teenagers. Activating kids and teenagers, providing cross-cultural learning experience for them as well as English language environment. It will be done through the games, workshops, sport activities, excursions, discussions, etc. Age of kids is 10-16 y/o. There will be a local monitor who is responsible to propose and organize activities. Each day, approx. four to six hours workshop/activities will be given in the mornings. The aim is that volunteers communicate with children in English, to encourage them to overcome the fear of speaking in a foreign language through non-formal educational methods and setting. In first two days of the workcamp participants will spend time together to know the program and prepared and propose some owns workshops in relation with your capacity, interest or ability. We want that the volunteers can be involved and take part of the all project. If you like dance, you can propose teach a dance; if you practice handball, organize a competition, etc. It would be a bonus if volunteers could speak a little Spanish but it’s is not essential. Accommodation will be a cultural house in La Pobla Llarga, where workcamp is taking place. There is a space for sleep (during the year is a psychometric space for the kindergarten), common space with a kitchen and bathroom and a terrace. For lunch and dinner, the cooker of summer school will cook for the volunteers. For breakfast the town hall gives volunteers the meal or money to buy food in the supermarket. Volunteers will sleep on mats. Please bring a sleeping bag! La Pobla Llarga a town and municipality located in the province of Valencia Spain, 50 km from Valencia and 20 min by car to reach the beach. There is a very good connection by train with Valencia. In summertime the city hall organises cultural activities at night. Town hall of La Pobla Llarga. The main aim of the “Urban Summer Camp” in La Pobla Llarga is to provide intensive experience of enjoying free time and learning English language for kids and teenagers during two weeks in summer. The camp program includes games, activities, workshops, sports, excursions, swimming pool, etc. Simultaneously, the workshops will try to teach other values such as intercultural, tolerance, the respect for the environment and promote the culture of peace. The language of the camp is English. Special: This project will include a one day only vegan food day agreed by volunteers for the promotion of environmental sustainable lifestyle. Please bring a sleeping bag! The technical work is focused on recovery and maintenance of the archeologic site of Castellar. There will be different tasks: cleaning of the excavation area and its surrounding, improve and preserve the environment and the access to the site, stratigraphic excavation of the area, interpretation and classification of the site’s objects and structures, study and document archeological materials, arrangement of the archaeological site. In the building close to the municipal swimming pool. The volunteers will live in the second floor of the building which is composed by a big dormitory, a pantry area, a patio and a dining room. There is an outdoor kitchen. The volunteers will use the bathroom and the showers of the swimming pool. Wide range of free time activities proposed: cultural visits, training activities, daily assembly, debates, swimming pool, games and party nights. During the weekends the volunteers will have the opportunity to visit la Llacuna, the medieval castle of Vilademàger and to make excursions to Plana d’Ancosa, Serra d’Ancosa-Brufaganya and Foix. De Amicitia ofrece la posibilidad de participar en diversos workcamps en España y en el extranjero como CAMPLEADER. Este ofrecimiento se dirige a voluntario que previamente han realizado campos con nosotros o en entidades similares, asi como monitores de tiempo libre con titulación o similar. De Amicitia ofrecera las siguientes formaciónes dependiendo de las necesidades y posibilidades del voluntario: - Curso de fin de semana a realizar en Madrid y Calpe durante la primavera de 2019 - Curso internacional financiado por la UE a realizar en Hungria, Chequia o Serbia - Curso de monitor de tiempo libre a realizar en Semana Santa en La Nucia, Alicante - Youth Exchange en Canaria durante Semana Santa Las plazas de campleader en España iran acompañadas de exención de cuota de campo, un apoyo de transporte hasta el campo y una gratificación entre 150 y 300 € Las personas que apoyen a los camlpeaders pagaran solo media cuota de campo Las plazas de campleader en el extrajero dependerán de las condiciones de cada organización de acogida. Consulta con la oficina las condiciones. The aim is that volunteers communicate with children in English, to encourage them to overcome the fear of speaking in a foreign language through non-formal educational methods and setting. In first two days of the workcamp participants will get a formation by Fundacion Cruz de los Angeles in order get to know the local environment and to understand the legal context of working with children under state protection (that includes signing confidentiality contracts and to comply with some restrictions). Children we're going to work with are aged from 6 to 18, therefore our group will be split into two non-fixed teams, where participants will rotate and organize different activities according to the kids age group. We will prepare activities and materials in English on different topics, such as archaeology, music, food, animals. With the older kids – teenagers, we will spend time in the afternoons, and mornings are for the younger kids. In a house situated in Colunga. Volunteers will stay apart from the group of children. Food will be provided by the Fundación Cruz de los Ángeles. Breakfasts will be prepared by volunteers, lunch and dinner in the house or together with kids, depending on daily activities. The province Colunga lies on the Cantabrian Sea and is located in the north of Spain, which is considered as the green area of Spain (lots of rain, trees and plants). Playa de la Griega is beautiful place and it is the nearest beach to the center town of the province, Colunga. This place is famous for one particular thing - here the footprints of dinosaurs were found. East of the beach on the cliffs is the famous and spectacular site of dinosaur footprints. The enormous size of these footprints, some of them reach 1.30 meters in diameter, allows it to be considered ones the largest footprints discovered so far. Fundación Cruz de los Ángeles is a social service which gives special attention to families, children and teenagers and specifically to those who are socially disadvantaged, people with less opportunities. They work to promote and enhance the comprehensive development of children and adolescents in the personal, family, educational and social fields, looking for the best way to their personal and group development. Through a creative and motivating learning, based on the coexistence of the languages of the participants, activities and specific proposals that fit our reality and our needs. De Amicitia and Fundación Cruz de los Ángeles started this collaboration few years ago and we continue with it encouraged with the great impact and meaning for kids and memorable experience for volunteers. Bring some information about your country or region in order to create activities with kids in the programme. You can bring photos, music, sweets, typical receipts, post cards, ideas for traditional games or dance. This project will include a one day only vegan food day agreed by volunteers for the promotion of environmental sustainable lifestyle. The technical work will consist on: - Conservation of the natural space of Fornos clay pond. - Construction of a new pond to increase the local biodiversity. - Follow-up of the different amphibians of the zone. - Elimination of invasive and exotic species. The Mediterranean School of l’Ampolla, volunteers have to bring a mat. Its possible that mattresses will be disposed on the floor but is still not sure. Sleeping bag needed. Kitchen and toilets of the school. Excursion from l’Ametlla de Mar to l’Ampolla through GR92, visit of the Ecomuseum of Deltebre. cycling excursion to the Fangar bay and the Centre for the Recuperation of Wild Animals, participation in local festivity of l’Ampolla, visit of the Olles Pond in the Natural Park of Delta de l'Ebre and bird-watching workshop, excursion in boat through the Fangar Bay and the mussels bed. The workcamp general objectives include learning the main techniques of archaeological excavation, raise the awareness about the importance of excavations, analyze and define hypothesis concerning prehistory and history. During the workcamp, the volunteers will: - Excave and extract, exploring different sectors of Can Sadurní cave, and prepare the excavation of the main entrance to the cave. - Participate in drawing stratigraphic sections and writing data of the pieces found, recover some heritage elements of dry stones from the surroundings of Can Sadurní. - Start the construction of a neolithical cabin located in the outside terrace of the cave. -Contribute to the maintenance of the surroundings and different access to the cave. In the sports centre of the school, mattresses will be provided. Sheets or sleeping bag needed. We will dispose of showers and toilets for girls and boys. 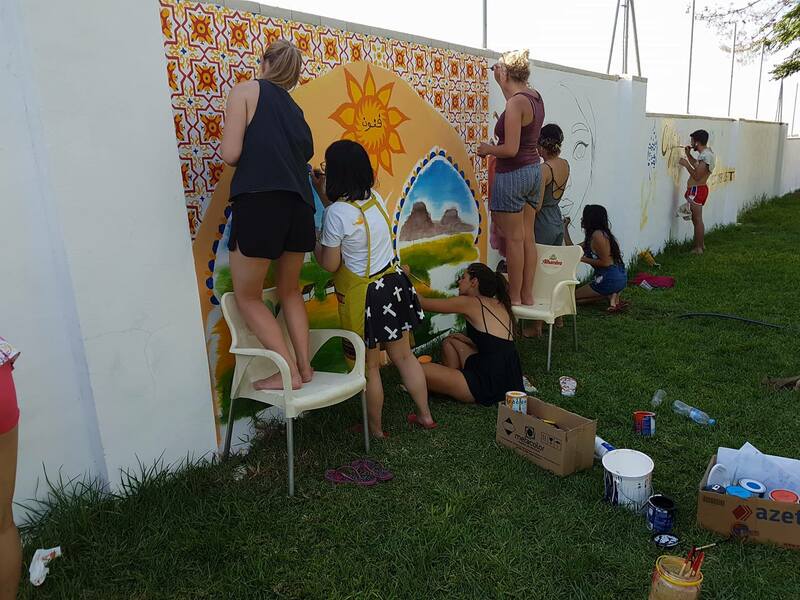 Volunteers will have a wide range of afternoon activities, evening and night games, which aim to improve group relationships and ventures into the area of human values. There will be an opportunity to visit the region and appreciate the most of its rich culture: overnight excursion to Garraf Natural Park, trip to Barcelona (one-day visit), theatre play open to the entire population of Begues (during the last evening the play will be done to represent the historical aspects of the cave from the findings), farewell party with technical team and mayors, rehearsal with “castellers” (one of the typical traditions in Catalonia). The work will involve renovating parts of the old town which have fallen into disrepair. The volunteers will rebuild local path and other infraestructures and create the access to the local bridge- the better to ancourage the young people of the area to become active citizens in their town and to try to avoid them leaving to go to bigger cities. Volunteers may organise a happening for locals on the last day to promote the idea of voluntary workcamps. Town hall will lend an old culture centre beside the local rural wall tennis court. Conditions are basic. Volunteers will cook breakfast but will have catering for lunch and a sandwich for dinner at local bars. Summer sleeping bag and lower sheets will be needed. This project will include a one day only vegan food day agreed by volunteers for the promotion of environmental sustainable lifestyle. Town of 3000 inhabitants is part of Madrid region, located 60 km north from Spanish capital. Town will enable volunteers to experience the countryside atmosphere in summertime. In free time you may visit Madrid and nearby El Altazar and its dam. City hall of Talamanca de Jarama. Sleeping bag and sheets is required. As a safety measure we ask participants to get a tetanus shot before arriving in Spain. Generally European Union citizens are already vaccinated. Please make sure you are vaccinated. The accommodation will be in the gym of a high school. As there is no one in the school during the summer, the accommodation and also the school yard will be just for us. There will be mattresses provided. And also town hall will provide the food for us and it will be cooked by the volunteers in the basic camping kitchen in the school yard. There are showers and bathrooms for girls and boys separately. Summer sleeping bag and lower sheets will be needed! This project will include a one day only vegan food day agreed by volunteers for the promotion of environmental sustainable lifestyle. Artistic knowledge or talents are requiered. For the application the volunteers have to send a portfolio or some drawings done by him/her. The work of volunteers will be to paint city walls. And create murals and drawings according to common agreement on topic and global idea of intervention. The townhall will provide the bucket paints and maybe some spray paints so that volunteers can create their art on the big walls around the town. We are looking for an artistic co leader for this project. The task of the co leader will be to organise the art work, help the volunteers on their designs. 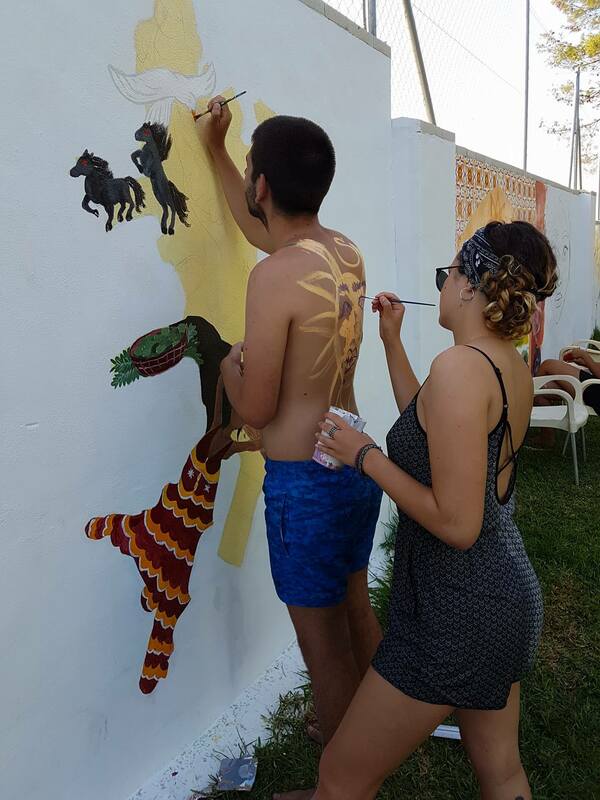 In this project, the first day are usually very important and caotic as the volunteers are designing their artworks on the paper and mostly they don't know how to fit their ideas to a wall and work as a team in the art field. The artistic leader will guide the volunteers in order to create harmony in their art works and if its needed show them some techniques to improve their work. De Amicitia wouldn't be able to pay the travel costs for the co leader but we can reimburse the travel from Malaga airport to campside. We don't ask any extra fee from the co leader.